What to do? What to do. Tonight I have that line from Before Sunset in my head...when he asks her "Are you depressed now?" "No, no, I'm not depressed. But, sometimes I worry that I'll get to the end of my life feeling I haven't done all I've all I wanted to do. I want to paint more. I wanna play my guitar everyday. I wanna learn Chinese. I wanna write more songs. There are so many things I wanna do, and end up doing not much." I know how she feels...that worry has crept into my brain many times over the past 10 years or so. I'm 31 and seem to always be searching for that THING. That passion. That artistic expression that is just going to feel so right and that I'll be freakishly talented at. ;) I've tried poetry, guitar, singing, dancing, sewing, drawing, knitting, painting, collage, photography, decorating...constantly looking for that feeling of creative "ahhhhh". I've found myself feeling like I'm almost in this frantic search for a creative outlet and not finding IT and wondering if IT will ever happen. Then tonight I realized that IT doesn't really exist. That IT is the desire to express in the first place. I've found myself in creative projects always feeling impatient to get to the finished product. That's why sewing has driven me nuts because it's such a process. It takes too long! I wanted to wear the dress darn it! Not the messing up a stitch and having to start that part over again. And yes, maybe sewing isn't my delicious cup of tea, but it's a good example of where my mind has been about what it is to feel creative expression. It seems so simple right..."it's the journey that matters, not the destination," but sometimes it just doesn't hit you/sink in until you're good and ready for it to. You know what...it's a wonderful thing that I get so excited and want to try new things, experience a new craft...even if I'm not great at it. I don't regret learning to somewhat play the guitar. Sure my fingers are too short and can't reach far enough to do a bar chord, whatever...it's fun to know how to play a G Chord. I like that I can fake sew something. It may not be perfect but it works! I love dancing even if I can't kick my leg to my nose. I love to sing even though my voice may sometimes crack. I LOVE the experience of it. I think I'll always be trying, testing, exploring new creative endeavours...and I'm finally understanding that that's actually a good thing. Someday I'll try that trapeze class, sign up for a woodworking course, plant my gorgeous vegetable garden, make a delicate chocolate souffle, get an SX70 polaroid camera and take photos that make me giggle and ahhh. With everything that's happening in the world around us right now, I'm feeling an intense responsibility to LIVE my life that I have the great honor of living. It may not be perfect. I may not be perfect. But that's more than okay. I've got desires. I've got my health. I have a roof over my head. I have love in my heart and amazing people all around me. I have the capability to do all of those things that I want to do. I have the gift of being able to explore and I'm not going to take a second of that for granted. 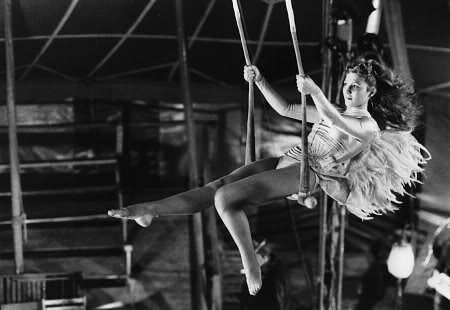 So here we go trapeze...are you ready for me? I don't know the original source of this photo. If you do, please let me know.